Beautiful rhinestone tiara. Gorgeous and all shine. Good Pageant Crown. Each girl Everyone wants a tiara worth one to wear. They can be worn to wear this beautiful diamond tiara in a prom dress or pageant dress. Arrow of cupid, we all know that meanings LOVE. This crown were very cute as it designed for arrow of cupid and heart together. 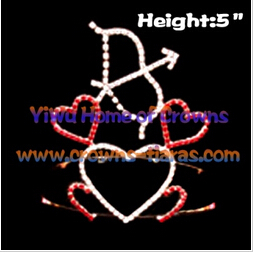 and in color of red,very loving..
As design if arrow of cupid,3inch 5inch 7inch in hand available. Next: Crystal Crown is absolutely gorgeous!